The work of artist Lee Krasner (1908-84), Jackson Pollock’s wife and widow, was dusted off and presented in a major traveling retrospective. The vivid paintings of the second-generation Abstract Expressionist Joan Mitchell, also were given the big-exhibition treatment at the Whitney Museum of American Art in New York City last year. With such offerings in recent decades, educators, curators and art historians have been reassessing modernism and its legacy, bringing deserving but overlooked artists back from obscurity. Many who have been rediscovered originally had been ignored or dismissed because of biases that prevailed in their time. Women artists suffered from such neglect; so did many African-American painters and sculptors. Of special interest on the West Coast is the activity of Asian-American modernists who, for the most part, worked regionally. During the early 20th century, Los Angeles and San Francisco attracted artists of Asian original who experiment with – and in novel ways absorbed – modernist modes of art-making. Although much of their work was lost or destroyed during the World War II era, or remains in the possession of their heirs and rarely comes to market, interest in Asian-American modernists seems to be growing. “I look at these artists less exclusively as Asian but, instead, more as representatives of the period of early modernism, “ says Harvey Jones, senior curator of art at the Oakland Museum of California. Jones’ institution owns works by such Asian-American modernists as Yun Gee (1906-63) and Hisako Hibi (1907-91), the wife of artist George Matsusaburo Hibi (1886-1947). The Japanese American National Museum in Los Angeles, the San Francisco Museum of Modern Art, and the Hirshhorn Museum and Sculpture Garden in Washington D.C., are other notable public collections that feature such artists’ works. Jones notes that the rarer more well-known artists’ works of the 193s and ‘40s become, the more demand increases for pieces by less-familiar early modernists. Nancy Moure, an art historian and independent curator in Los Angeles, spent years researching and writing California Art: 450 Years of Painting & Other Media, an encyclopedic survey that situates noteworthy Asian-American modern artists in appropriate historical contexts. Looking back at the scope and variety of their work, Moure recalls that their earlier explorations of abstraction gave way in the 1930s to American Scene painting, which became that decade’s dominant trend. “Asian-American artists brought their ideas, techniques and subject matter to both kinds of art,” she says. Moure’s book points out that in the early 1900s, European-derived modernism generally was not as strong current in California, especially in and around Los Angeles. During World War I, European artists fleeing a battle torn continent gravitated toward Southern California. 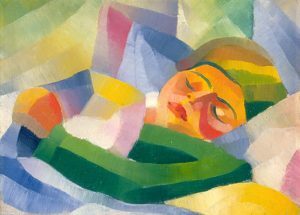 Later, American artists such as Stanton MacDonald-Wright (1890-1973) and Morgan Russell (1886-1953), who had spent time in Paris soaking up revolutionary new ideas about art, headed to California. 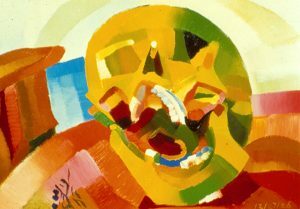 With them they brought Synchromism, a way of painting structured forms mostly with pure color. MacDonald-Wright organized the first-ever exhibition of modern art in Los Angeles in 1920. Among Asian-American modernists of note whose oeuvres visibly melded styles, techniques and sensibilities from the East and West was Yun Gee, who left southern China in 1921 to join his immigrant father, who had already settled in San Francisco. There, a lively art scene exposed Yun Gee to California Impressionism and other European-derived modernist styles. Yun Gee studied at the California School of Fine Arts (now the San Francisco Art Institute), then modernism’s local bastion, and founded an artists’ cooperative, where he taught other immigrants. 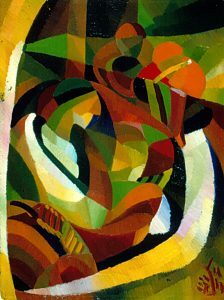 His teacher at the art school, Otis Oldfield (1890-1969), advanced a color theory of his own that Yun Gee assimilated. The young artist’s paintings included portraits of figures and faces rendered in patches of bold color, with little line drawing or shading to further define them. Still, their emotional impact and psychological character could be vivid. Yun Gee did two formative stints of his on in Paris before moving to New York City at the start of the 1930s. In their lifetimes, Dong Kingman (1911-2000) and Chiura Obata (1885-1975) became known as watercolor masters; Obata, who used both traditional Japanese sumi ink and water-based colors, sometimes ground his own pigments. Kingman was born in Oakland and moved with his family to Hong Kong when he was 5. A skilled calligrapher and watercolorist at a young age, he returned to Oakland in his teens, attended art school and went on to pursue a long career that included work on several Hollywood films, including “The World of Suzie Wong” (1964) and “The Sand Pebbles” (1966). Kingman’s urban scenes, like Coit Tower, 1949, captured the rhythms of city life. His understanding of depth in pictorial space and his deft draftsmanship pushed the watercolor medium’s technical limits. The Japanese American National Museum, whose programming includes exhibitions and the gathering of historical materials, a repository of significant Obata and Hisako Hibi collections. Born Hisako Shimizu in Fukui, Japan, she came to the United States in 1920 and boldly decided to stay in San Francisco when her father moved the family back to Japan five years later. She studied at the California School of Fine Arts, where she met George Matsusaburo Hibi, a fellow issei (first-generation Japanese-American) whom she later married. Other aspects of Asian-American modernists’ careers, including that of Yun Gee, will be examined in The Not-so Still Life: A Century of California Still Life Painting and Sculpture, a new book by Patricia Trenton, Susan Landauer and William H. Gerdis to be published by the University of California Press in the fall of 2003. It will accompany an exhibition of art from California that will open in November at the San Jose Museum of Art. Meanwhile, researchers associated with the West Coast branch of the Archives of American Art in San Marino, California, are busy compiling Asian-American Art: California Confluences and Crosscurrents. This comprehensive volume, which is being readied for publication in two to three years, will document the careers of some $1,200 artists. “This project is about recovering all this rich art history,” says Mark Johnson, a professor at San Francisco State University who is coordinating the big research effort and has helped organize exhibitions of Asian-American modernists’ works at his school. “I’ve always wanted to see these artists become more widely recognized,” Moure says. Now, little by little, thanks to the efforts of a small but determined band of researcher-rescuers of which she is a part, Asian-American modern artists’ achievements are beginning to find their place in art history’s canon.